TSE:RY, or the Royal Bank of Canada is one of Canada’s “Big 5” banks. They provide personal and commercial banking, wealth management services, insurance, investor services, capital markets products and services on a global basis. RBC is one of the most diversified banks in serving personal, business, public sector, and institutional clients in Canada, the United States and approximately 40 other countries. Being the largest bank in Canada and one of the Top 15 largest global banks by market capitalization doesn’t solely make RBC a good investment. Why is RBC an attractive investment? Let’s take a look. If you’re interested in some other Canadian dividend giants, check out our list of the top Canadian dividend stocks. For two years running RBC has a ranked either #1 or #2 in all key Canadian Retail banking products and in all business products. With 61% of their revenues originating in Canada this leadership position is key, as they will benefit from an improving Canadian economy. This continued leadership is reflective of both their strong operating results and perhaps more importantly, their strong brand loyalty. Since overtaking TD in 2014 as Canada’s Top Brand, RBC has not relinquished the #1 spot on Brand Finance’s Top 100 Canadian Brand list, as they secured the top spot again in 2017. Likewise, they have been named the 2017 Global Retail Bank of the year thanks to their excellent customer service and were named as one of the Best Workplaces in Canada. 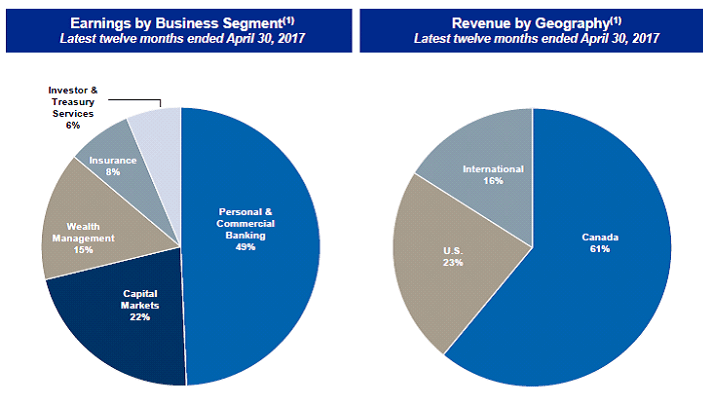 The majority of RBC’s revenues are tied to the Canadian market and to the Personal & Commercial Banking segment. 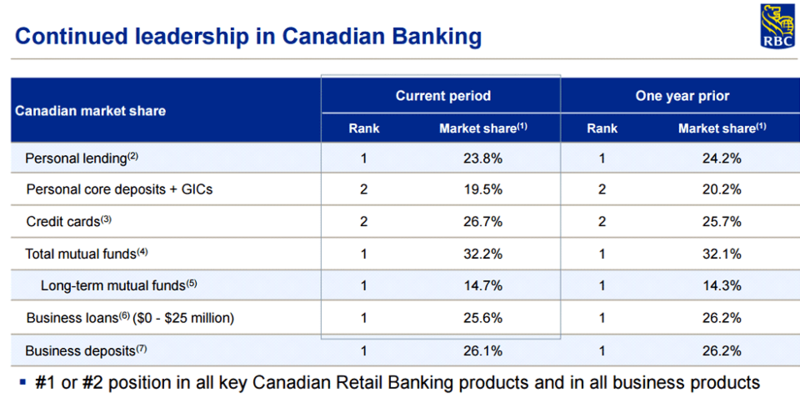 However, RBC is also the most diversified company of all the Canadian banks. As such, they are in a strong position to take advantage of a recovering Canadian economy and are well positioned in the case of an economic downturn. RBC’s strong operational result over the past few years has been reflected in their share price appreciation. On a trailing 5YR basis, RBC has significantly outperformed their Canadian peers returning 81.50% for an annualized average growth rate of 16.3%. Shareholders have enjoyed outsized returns due in part to RBCs solid financial performance. The company has grown revenues at a healthy clip and has a strong Return on Equity (ROE). Likewise, the company has aggressive mid-term growth objectives as they are targeting earnings per share (EPS) growth of 7% and ROE in excess of 16%. This is in-line with analysts who estimate that RBC will grow earnings by 6.41% over the next couple of years. There is no reason to believe RBC cannot deliver as they have met or exceeded estimates in each of the last 4 quarters, and 9 of the past 10. Canadian banks have long been known as steady and reliable dividend payers. During the financial crisis when U.S. banks were cutting their dividends Canadian banks weathered the storm by maintaining their dividend levels. The importance of this cannot be understated and speaks to the strength of the banks and their commitment to the dividend. 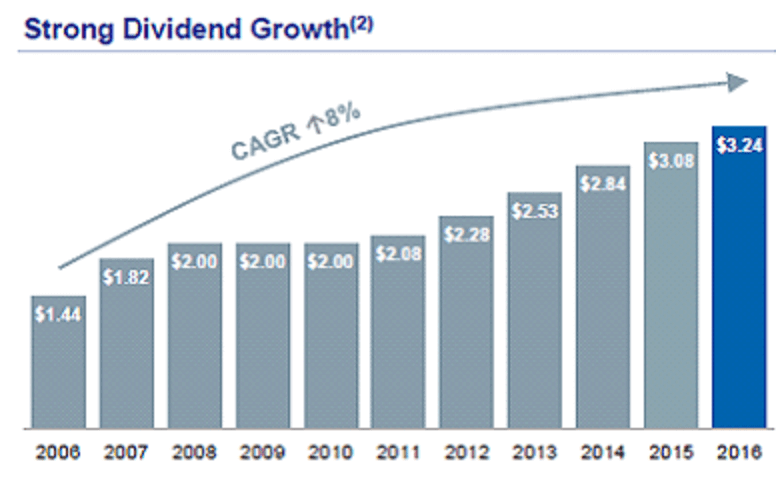 RBC has since successfully raised dividends for six straight years with 1YR (5.2%), 3YR (8.6%), and 5YR (9.3%) growth rates. As impressive as these growth rates are, what investors really care about is if dividends will continue to rise in the future. RBC currently has a targeted dividend payout ratio of 40%-50% and as of end of day July 14, 2017 their payout ratio was sitting comfortably within that range at 47.3%. This leaves ample room for growth in the near future given their expectations of 7% EPS growth. It is therefore reasonable to expect that RBC will continue raising dividends along with earnings growth to the tune of 5%. On July 12th, the Bank of Canada (BOC) raised overnight lending rates by 25 base percentage points (bps). There is also an expectation that the BOC may raise rates again in the near future. It is therefore important to note that rising interest rates will have a positive impact on banks net interest income margins. Although a 25 bps raise won’t move the needle a great deal, if multiple raises occur in the next few years, the impacts can add up. In 2016, RBC had Net Interest Income (NII) of C$16.531 million and NII margin of 1.71%. Of the total NII, 58.6% or C$9.683 million originated from their Canadian banking segments. Based on these numbers, RBC could have posted an additional C$24 million in NII, which would have resulted in an additional C$0.02 EPS. Over the years, RBC shareholders have been well rewarded with both capital appreciation and a growing dividend income. Although history is not necessarily a precursor to success, RBC is well positioned for continued growth and they have a clear shareholder friendly return of capital strategy.. As with any investments RBC is not without its risks and are susceptible to a downturn in the Canadian economy just like anyone else, in particular a housing crash. That being said, the BOC is raising rates because they have confidence the Canadian economy is stable and will continue their recent return to growth. As always, investors should have a clear understanding of their own risk profile prior to investing and are encouraged to do their own due diligence.